A comprehensive list and profile of all of Naples Beaches and where they are located. The Travel Channel selected the Naples Beaches as some of America´s Best. 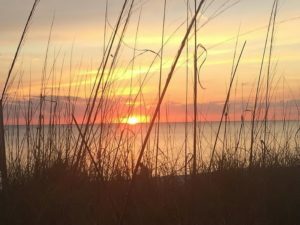 From Captiva in the North to Cape Romanol in the far south, seventeen beachfront parks and numerous beach accesses line the shoreline of the greater Naples area. White sugar sand and tropical breezes make them the perfect place to enjoy a day. Stay and enjoy one of Naples’ spectacular sunsets, you will be glad you did! Over 350 acres of pristine beaches and woodland trails highlight a trip to Barefoot Beach Preserve in northern Collier County. Enjoy a mile and a half of natural beach covered with powdery white sand. A great trail system meanders through tropical hammock and mangrove swamp. It is a perfect place for watching wildlife with turtles, ospreys and bald eagles being a common sight. A learning center features exhibits on sea turtles and shorebirds. Lectures are offered on subjects as varied as shelling and fossil collection. Facilities include showers, restrooms, snack bar, fishing ramps, picnic tables, fishing gear rental. South off Bonita Beach Road. With two and one half acres of beach front park, Bonita Beach is the perfect place to spend an afternoon. Swimming, soaking up the sun, hunting for shells, sailing, building sand castles or playing volleyball all make for a fun filled day. Make sure to stay till the end of the day, as it is one of the best places to enjoy one of Southwest Florida’s magnificent sunsets. At the south end of the beach is the county-run park with parking, showers, picnic areas and grills. Bonita Jet- ski and Parasail offers everything you might want for a perfect day on the beach including jet skis, catamaran sailboats and parasailing. Open all day, Doc´s Beach House is a great place to grab a burger or pizza and a cold drink. Located just south of Lovers Key off of Hickory Boulevard, Dog Beach is the only one of the Naples beaches where dogs are allowed to run free. If your canine is your best friend you will definitely want to take him. You can both frolic in surf and he can play with his new found friends. There are do-do bags available at the parking lot and you will want to be sure to bring water as there are no facilities. Parking is free and the park is open sunrise to sunset. It is always a good idea to arrive early. Clear, emerald-green water and a wonderful white sand beach await the visitor to this historical Naples Beach. The pier stretches 1000 feet into the gulf and is a great place to catch a sunset. Built in 1888 as a freight and passenger dock, narrow gauge train rails spanned the length of the pier transported freight and baggage in the early 1900’s. Part of the structure was razed by a fire in 1922 and was rebuilt after being damage by hurricanes in 1910, 1926, 1960 and 2015. It´s a favorite spot for local fisherman and since you don´t need a license you might want to try your luck. Today it remains a public symbol of the area’s history. Naples Pier is at the west end off of 12th Avenue S. Extending 1,000 feet into the Gulf, it is great for fishing or watching sunsets. Facilities include metered parking, bait, snack bar, restrooms and outdoor showers. Did you know that you can get a free parking permit for all of the Naples Beaches. All you have to do is be a Naples resident or own your own place in the sun.